How to unlock Get 120 stars with both Mario and Luigi, then complete The Fate of the Universe a second time. The Grand Finale Galaxy is the final galaxy in Super Mario Galaxy. 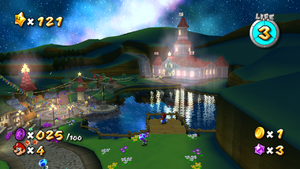 The level takes place in Castle Gardens (also called Toad Town in the guide by Prima Games) from the beginning of the game, with creatures from later parts of the game now attending the Star Festival, including Penguins, Bees, Gearmos, and Star Bunnies, the four major NPC types in the game. The galaxy is unlocked after all 120 Power Stars have been obtained with both Mario and Luigi, and is reached by talking to the fourth Green Luma on the Planet of Trials. This galaxy has the 121st Power Star for both Mario brothers. The Toad Brigade and their ship, the Starshroom, are found outside of the castle. After the player has collected all the Purple Coins, the Mailtoad will receive a message. If the player talks to him, he will send a congratulatory picture to the Wii Message Board. This picture differs depending on whether the player spoke to the Mailtoad as Mario or Luigi. If Mario speaks to him, the picture will show Mario and Peach standing on the Starting Planet of the Good Egg Galaxy with some Lumas, including Young Master Luma. If Luigi speaks to the Mailtoad, the picture will feature Luigi and Rosalina standing in front of Peach's Castle with the Toad Brigade. The picture can also be sent to friends. On the list of galaxies, this galaxy is simply called "Grand Finale", lacking the "galaxy" name at the end that all other galaxies on the list have. Toad Town and the exterior of Princess Peach's Castle are shown. The castle and the area around it is based on the design introduced in Super Mario 64, containing a large lake with a river flowing into it, but expanded to include a pathway to Toad Town. The path goes through the town and into the castle. There is an invisible wall that stops the player from entering the castle itself. This mission's objective is to collect the 100 Purple Coins in Toad Town and the Castle Gardens. It is possible to take damage (and die) in this level. The player can simply jump into the fire roasting food that is just past the gate to Peach's castle area near Yellow Toad. This is the only Purple Coin mission that does not have the words "Purple Coins" in the name. It is also one of only two not triggered by a Prankster Comet, the other one being in the Gateway Galaxy. This is the only galaxy not mentioned in the Prima Games guide. This page was last edited on February 19, 2019, at 22:09.